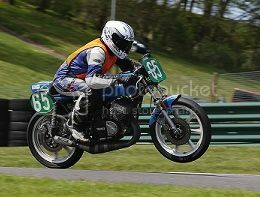 The RAF team need a RD250 race bike for a new member. To be used in the CRMC post classic aircooled class. Need to give people a nudge to sell those old FRC bikes not being used. Cheers Keith, looking for a complete ex race bike ideally for the lad. However I'm interested in the frame. Looking for another one if anyone has anything? Will it make it out this season mate ? and are you tuning it ? Keith, should be out. One which Gav is riding should be out at Snetterton we've just an engine to out together when I'm back in the UK. Ian should be collecting a bike from Portsmouth next week which should be out for Silverstone. Ian's is already tuned and Gavs I've tinkered the cylinders out here but it really needs pipes to suit. Plus I need to cut Gav some heads. Just off standard tuning nothing like the time I spent on John Warwicks.